Happy Halloween! I am typing this by the haunting glow of a jack-o-lantern... I blame all typos on the less than suitable lighting conditions. This evening's card is the "hit" from the pack I submitted for Thorzul Will Rule's First Annual Card Halloweenification Contest. That is not the actual name of the contest, but I figure if you win the thing you earn some re-naming rights. The rules of the contest were fairly simple: to "Halloweenify" a baseball card and submit it for judging. Entries could be sent via email, but it was made clear that cards "in hand" would have an advantage. I decided to use my collecting philosophy to win the contest. If one card is good, a bunch of cards is better. My concept was to manufacture a pack of cards, including the wrapper. I thought it would be cool to create cards of horror movie villains. Using a card design contemporary to the release date of the film (i.e., Psycho 1960, The Shining 1980, etc.) I figured it would be a diverse and entertaining pack. After four cards I was happy with the progress. It was good. It wasn't great. The choice of what set of cards to use as a model was easy, thanks to my recent addiction to '08 Allen & Ginter. I really like the encased mini autos and game used cards. I have a few gamers that I wouldn't miss; and the "shell" would certainly add to the authenticity I was aiming to achieve. A little x-acto knife action and a steady hand, and Mr. Sexson was free. I found another copy on Check Out My Cards. So if I ended up missing his original, encased state I could always get another. I used a Brian McCann card as a base for my design. With minimal MS Paint manipulation, the card began to take shape. Like I did with all of the cards, I printed my designs on sticker paper and affixed the fronts and backs to old Milwaukee Brewers cards. I_had_to_cut_a hole in the substrate card large enough to accomodate the "game used" material. The material was a little more complicated than I expected. At first, I cut a swatch of soiled tube sock. I thought it mimicked the vomit stained nightgown quite well. Unfortunately, The sock was too thick. Fortunately, I found a pair of holey, old underwear that had been serving as a dust rag. Sorry, Thorzul. The sticky reverse of the card back held the briefs in place while I stuck on the front. Inserting the new card into Richie Sexson's old haunts proved much easier than the original operation. This is what the "finished" product looked like, fresh outta the pack. What few people know... There was supposed to more!!! I was going to make the card MUCH more dramatic! The "game used" card was going to come to life. By melting a couple of shades of green crayons, I was planning on having pea soup colored "vomit" spewing from the opening on the front of the card. It would have been AWESOME!!! I wasn't sure how the molten crayon would react with the plastic case, so I decided to leave it off. In retrospect, I probably wouldn't have sent in the entry if it would have turned out as awesome as I had imagined. If nothing else, we gained another post on Things Done to Cards. I thought I would 'borrow' an idea from Dinged Corners and for today's TDTC post, play "What *IS* that thing!?" Looks familiar... I think I may seen that once before... Candy? What is that? A fruit roll-up next to a minefield?? Is that image even suitable for children!? Many sets published these days include a time-critical element. They could have redemption cards, for example, or series-specific subsets. The message is clear: you need to purchase more cards now. Seriously, get that extra box this minute or suffer from a poorer collecting experience. For example, Topps' 2008 Allen & Ginter issue included a puzzle contest in its World's Greatest Victories subset. Solve the puzzle (and someone did) to appear in next year's version. Awesome. Unfortunately for your savings account, solving the A&G puzzle meant collecting two rare parts of the set, the Victories themselves and the (humorously fictional) Team Orange baseball players. 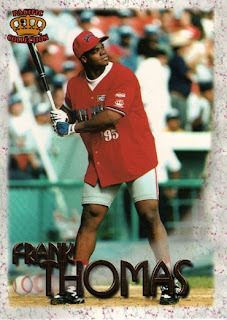 Though the former showed up with some frequency, Topps stated that those T.O. cards came only 1 to every 6 boxes. You can see how the strategy would (ideally) move a ton of product! As successful as A&G's idea proved, and it helped that the set was generally excellent, Topps' contest is hardly an innovation. As observed in one of my business classes, is there anything about motivating people that wasn't already known in Moses' time? Given the contest's era and localized nature of the release, it's surprising that a full set made it to the 21st Century—but at least one did. The great collector (and wartime agent) Edward Wharton-Tigar's estate sold it as part of a larger lot in the late-1990s and the Honey Boys went as a unit for $5000 soon after. I recently acquired an unpunched #5, “Snake” Siddle, which brought them onto my personal radar. 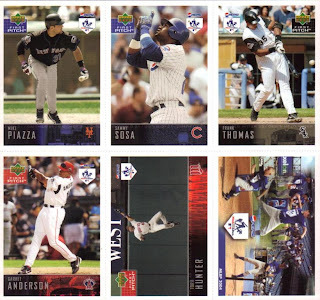 As noted on Cycleback's story of the set, most cards are major league stars, but the first 8 show Canadian players. Mr. Siddle later became an umpire in the Great White North and is only known to the interwebs as calling a 1930s barnstorming game pitched brilliantly by Satchel Paige. But did Snake score some free ice cream for his efforts? And did he eventually Escape from Manitoba? There isn't really anything that unusual about 1993 Topps and I actually really like the design from that year but I wanted to feature this odd-ball card from the set. 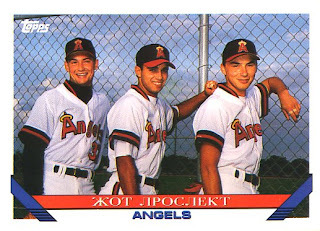 In 1992, the Angels apparently drafted three Russian players. Each of them played for the Angels rookie level teams in 1992 and 1993, and then I guess they were deported. Rudy Razjigaev was a pitcher who appeared in 15 games, pitching 13 innings. That's not a lot of work for two years. He had an ERA near 6. Yevgeny Puchkov was an middle infielder who appeared in 52 games with a .208 batting average. Ilya Bogatyrev was a 3rd baseman who appeared in 44 games and hit a lusty .241. I wonder what happened to these guys? This is a really obscure card set. It is not listed in either the big Beckett or the big Sports Collector's Digest catalogs I have. It is, however, listed on Beckett.com. There is nothing special about the cards or the set (although Derek Jeter is featured in the set). I have 3 of the 150 cards in the set which I got in a repack somewhere along the way. I only posted this card because of who is on it. That's right, Bobby Bonds Jr., Barry's little brother. 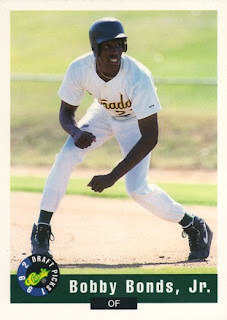 Junior played one year of ball at Canada Junior College in Redwood City CA before getting drafted by the Padres in the 18th round. Canada is spelled with a tilde over the N (you can just about see it in the photo). It is known for having a large program to teach English as a second language. There are actually some notable ball players from there, Moises Alou and Harold Reynolds. On the back of the card it says "Bobby Bonds, Jr. is known for his agressivness in the outfield, on the basepaths, and at the plate. He follows in his father's footsteps as an outstanding defensive outfielder. Scouts have marvelled at this explosive quickness and raw talent for the game". This judgment was based on 27 games for Canada, where he had 64 AB, 4 HR, 20 RBI and 16 SB. But apparently this "raw talent for the game" didn't get him anywhere as he wasn't signed by the Padres. Well, at some point, the fine folks at Upper Deck decided that patches actually USED or WORN by players was getting passe' (not to be confused with rounding up a posse, which we may all do after this post). So, instead of using the bits and pieces they already had, Upper Deck decided to have someone MAKE UP patches for them! Rather than call them "patches we paid someone to create," Upper Deck chose the softer, gentler vernacular: Manufactured Patch. Ah, doesn't that just roll off the tongue? 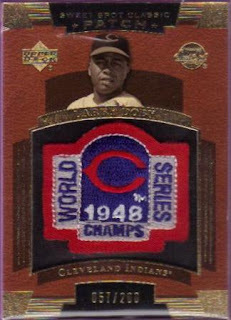 This is a 2004 UD Sweet Spot Classic Patch card of Larry Doby. Don't get me wrong... I think these are VERY cool cards. If you can't get a real memorabilia piece from Larry Doby's collection, you can always make up your own! The look and feel of this one is pure vintage stuff. Even the patch looks like it could have come from a 1948 cap (you know, a little insignia to commemorate the title sewn into one side or the back). Speaking of back, the back of the card makes it clear that this is no "run-of-the-mill" game-used item here, folks: "(This) souvenir logo patch... was specially created for the Upper Deck Company..."
This one is a 2008 Upper Deck Premier Stitchings Travis Hafner card. How many people do you know that have a patch made in their likeness featuring their nickname? Yeah, me too... By the time these gems were being kicked out, the backs of the cards state, "You have received a manufactured patch baseball card. On the front of this card is a manufactured patch. Enjoy your card!" Okay, what am I, an idiot? 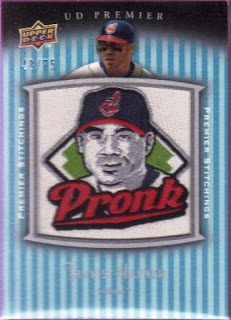 Am I so dense that you have to tell me TWICE in back-to-back sentences that the patch on this card was never worn by Pronk? 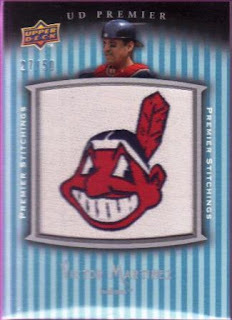 The Victor Martinez is also a 2008 UD Premier Stitchings, but his features Chief Wahoo instead of his own likeness and nickname. The back of his card says the same thing as Pronk's. Basically, it reads, "We paid someone to create this patch. No one wore it. We made it. Well, *WE* didn't make it, we had someone make it for us, but in case you don't understand that, we are going to tell you again - we had someone MAKE this patch for us. And you bought it. 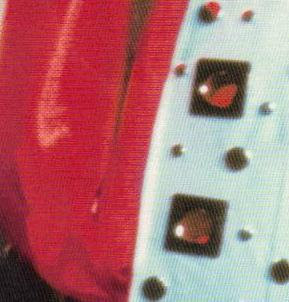 Sucker." I cannot believe it has been four years (this being written in 2008) since my son participated in the 2004 Pitch, Hit, and Run contest that was held in our town. He did well enough to make it to the regionals in Houston, but decided he didn't want to go. That turned out to be a shame because we were told he would have been the ONLY contestant in his age group. I find that hard to believe, but whatever. At the contest, there were stacks of these sheets laying on a table. They were free for the taking. I wish I had been a lot more greedy than I was. I snagged two untorn sheets and left a LARGE stack behind. The cards came in a set of six and are perforated, should one wish to separate them. The only thing that distinguishes these cards from regular 2004 UD First Pitch cards is the white home-plate logo with "Pepsi" above it. The home-plate logo is the Pitch, Hit, and Run. Though there are six cards, only five players made the cut: Garret Anderson, Torii Hunter (An Arkansan), Mike Piazza, Sammy Sosa, and Frank Thomas. 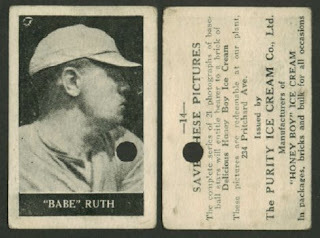 The sixth card is one that features a child pitching, hitting, and running and the back has a place for the contestant to record his/her results from the contest. 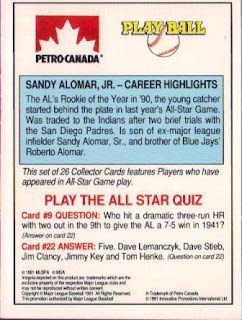 During a recent mailing, I received a 1991 Petro-Canada Allstar Fanfest Stand-up card. The cards were handed out at the All-Star game in Tornoto. 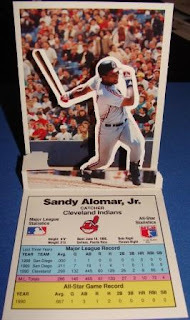 There are 26 players in the set with the sole Indians player being Sandy Alomar, Jr. 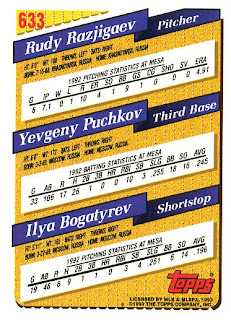 The back of the card sports a "Career Highlights" section regarding the featured player. There is also a trivia question followed by a trivia answer to a question from another card. Don't you just love the fans in the background? Cal Ripken, Jr; Greg Olson; Roger Clemens; Ryne Sandberg; Dave Winfield; Eric Davis; Carlton Fisk; Mike Scott; Sandy Alomar, Jr; Tim Wallach; Cecil Fielder; Dwight Gooden; George Brett; Dale Murphy; Paul Molitor; Barry Bonds; Kirby Puckett; Ozzie Smith; Don Mattingly; Will Clark; Rickey Henderson; Orel Hershiser; Ken Griffey Jr; Tony Gwynn; Nolan Ryan; and Kelly Gruber. Here's something you don't see every day, a baseball player's knees. Frank looks like he forgot to put his pants on when he came up to bat. 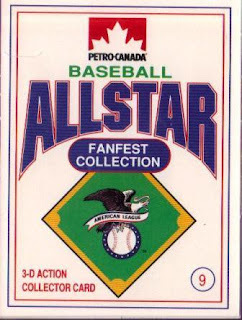 There are 8 cards in this set: Mike Piazza, Sammy Sosa, Frank Thomas, Roberto Alomar, Carlos Baerga (of course), Edgar Martinez, Bernie Williams, and Kenny Lofton. All of them played in this celebrity softball game in Puerto Rico put on by Baerga in 1995. The cards were given away at the 1996 game. I got these in an interesting repack put together by Fairfield. The cards came in a nice cardboard box with a hinged lid. "Contains At Least 5 Packs". "Special Bonus Mystery Box Inside". "Contains 200 Cards Plus Rookies & Stars". At Least One Memorabilia Card in Every Box". All this for $19.99 plus tax. The Baerga cards were inside the "Special Bonus Mystery Box" along with a 2005 Fleer Patchworks Jersey card of Michael Young (Upper Deck swears the jersey piece came from a jersey actually worn by Young in an official Major League game). Plus a hunk of Styrofoam. The main box also has the usual collection of mid-1980s to mid-1990s cards, plus one football card. Bob Gain of the University of Kentucky's. I never heard of him but Gain sounds like a good name for a running back but he was a lineman who played in the 1950s for the Browns. 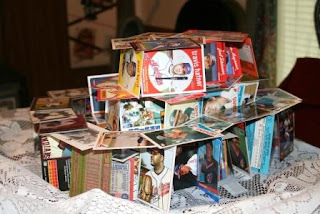 BadWax is having a "House of Cards" contest, in which readers are invited to submit an entry depicting the use of no more than 100 baseball cards to build a house... 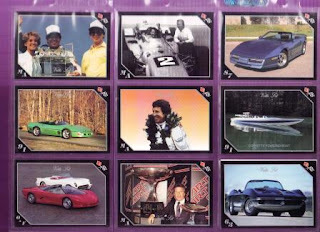 The post says to use cards from the 80's and 90's, but I used cards that ranged from the 70's to today... That may disqualify me from winning the prize, but it didn't stop me from having some fun... So, today, I present, "Things Done With Cards:"
My "Official Entry" photo of the finished house (above). It is right at the high-end limit of cards (100). It's a three story creation which uses an almost-but-not-quite geometric shape. Each floor is actually the same height, but the "facade" around the first floor gives the impression that the second story is half-height (ahh, like the old MFM hard drives I used to work with....). This picture (above) shows the completion of the first level with the raised outer 'ring' that would later help serve as support for the second story. I tried to take the photo so that you can see some of the construction techniques (if you can call it that) I used. Interesting things keep popping up in my e-mail lately. The latest one was a chance to review a website for facial tics caused by Tourette's Syndrome. I could either take my payment through a PayPal payment or a free sample of the product. I kindly replied that this was a website for sports cards and this was not the proper venue to do that. I never in a million years, would think that someone would mistake this site as a site to review medical scams, but whatever. A slightly older e-mail popped up with a link to an eBay auction with this card. The auction is now over and I have no clue as whether anyone actually bid on this unique card. I'm too lazy to look it up. The auction listed the card as "likely a kid's art project" and urged people to purchase it based on that fact. It was refreshing to see someone actually try to sell something "as is" and not try to pass this off as an error or an employee prank. 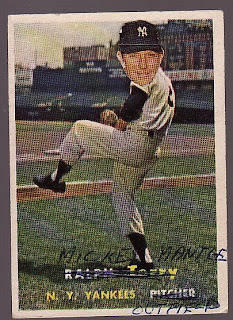 Someone took a 1957 Topps card of Ralph Terry and attached a cut out head of Mickey Mantle to it. To add insult to injury, they scratched out Ralph Terry's name and position and wrote (in pen) Mickey Mantle and his outfield position. Truly this is the work of some visionary. The only thing missing is the replacement of the number on the back. I'm sure the world is littered with examples such as this. You know what? That's great to see. It gives us a peak into the mind of a mystery person circa 1957. Plus, it gives us something fun and interesting to look at today. Long live Mickey Mantle, the big headed pitcher! 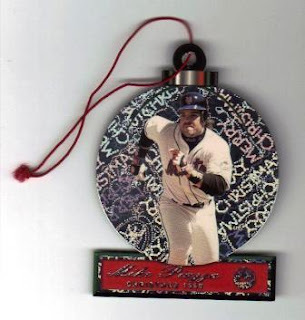 Is that a Mike Piazza hanging from your tree, or are you just happy to see me? You have to admit, when it comes to die-cut cards, Pacific was pretty much the king of the hill. I have never seen so many odd shapes and configurations as Pacific developed over the years. These 2000 Ornaments are no exception! 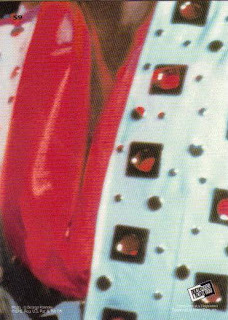 There are only 20 cards in the set and each was cut out to resemble an ornament. Some were bells, stars, balls, whatever. They've got a cool holographic design in them that makes them do all kinds of 'shiny' things when the lights of your tree shine upon them and the ceiling fan move the air, creating a breeze... Well, I *DO* live in Arkansas, after all. The players in the set include: Mo Vaughn, Chipper Jones, Greg Maddux, Cal Ripken Jr, Nomar Garciaparra, Sammy Sosa, Frank Thomas, Manny Ramirez, Larry Walker, Jeff Bagwell, Mike Piazza, Roger Clemens, Derek Jeter, Scott Rolen, JD Drew, Mark McGwire, Tony Gwynn, Ken Griffey Jr, Alex Rodriguez, and Ivan Rodriguez. It's one thing to see yourself on a baseball card, but I wonder what the players think when they see themselves on one of these things... "An ornament!? Really? And my agent signed off on this? Can I have one?" Over on "A Pack A Day," I posted an article that talks a little bit about these gems. I first heard about these cards on "Cardboard Junkie" and knew I had to create an article, as it were, for TDTC! I mean, come on - cards inside cards!? 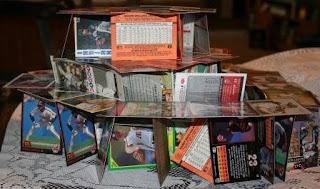 What crazy fool would buy a baseball card only to rip it open and see what was inside!? Evidently, a lot of us! Each pack has three 5x7 cards. 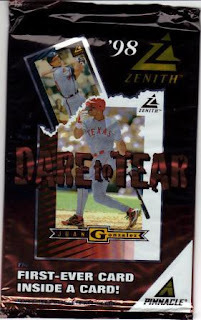 The cards feature player pictures, a Zenith logo, the player's name in foil (gold/silver), and the team name. On the back is a different player pose, the card number, player's position, a short 'greatest stats' paragraph and some bio info. There is also an instruction sheet on how to best rip the card without ripping the little guy inside. So what happens when you rip one? 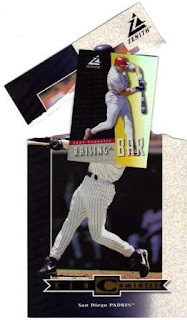 Well, I tore off Ken Caminiti's head to find that inside Ken was Juan Gonzalez "Raising the Bar" insert. It's shiny!